What terms do we use to describe and evaluate art, and how do we judge if art is good, and if it is for the social good? In How Art Can Be Thought Allan deSouza investigates such questions and the popular terminology through which art is discussed, valued, and taught. Adapting art viewing to contemporary demands within a rapidly changing world, deSouza outlines how art functions as politicized culture within a global industry. 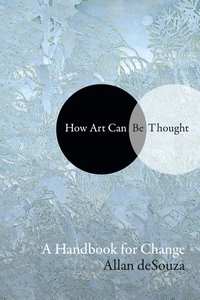 In addition to offering new pedagogical strategies for MFA programs and the training of artists, he provides an extensive analytical glossary of some of the most common terms used to discuss art while focusing on their current and changing usage. He also shows how these terms may be crafted to new artistic and social practices, particularly in what it means to decolonize the places of display and learning. DeSouza's work will be invaluable to the casual gallery visitor and the arts professional alike, to all those who regularly look at, think about, and make art--especially art students and faculty, artists, art critics, and curators.